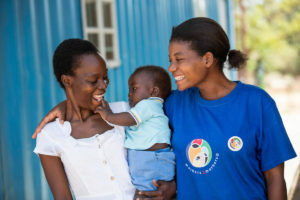 mothers2mothers (m2m) is delighted to join forces with the Conrad N. Hilton Foundation (Hilton Foundation), a global leader in the field of Early Childhood Development (ECD), to launch an innovative new programme of integrated ECD services in Malawi via a $1.2M, three-year grant. Our work will be focused on Mulanje, a district in southern Malawi with the highest HIV prevalence rates in the country—20.6% of the general population and 25.9% of women are infected with the virus in the district—creating a critical need for ECD interventions for children in households affected by HIV. Such interventions are vital as HIV-positive or -exposed children face significant risks of developmental challenges and delays. Research has found that during pregnancy, HIV may invade the central nervous system of a foetus, resulting in potential brain growth impairment and delays in achieving developmental milestones. Furthermore, children exposed to or living with HIV are particularly vulnerable to adverse events and stressors at home—such as parental illness and death, parental stress and poor mental health, and reduced stimulation and child care quality—which can be detrimental to their wellbeing and development. Not addressing these issues in early childhood can lead to a lifetime of challenges, as a growing body of evidence demonstrates that quality healthcare, good nutrition, and social and emotional stimulation through early childhood are foundations for success later in life. Children deprived of these key factors are likely to have low education levels, income, and poor parenting skills as adults, perpetuating a damaging cycle of poverty and early childhood deprivation. With this award, m2m will provide a quality ECD intervention at ten health clinics in total – four in the first year, and an additional six from 2019 onwards. The focus will be on creating stimulating home environments and providing education and support to parents and caregivers, to foster the adoption of positive childcare practices designed to support children’s cognitive, social, emotional, motor, and language development and physical growth. A programme of ECD services will be integrated into m2m’s core Mentor Mother programme in Mulanje, which has been operating for the past two years with funding from the Elizabeth Taylor AIDS Foundation. Over the course of the three-year award from the Hilton Foundation, thousands of HIV-infected or vulnerable children are expected to be reached with our services. We also hope to contribute to the national agenda – as Malawi’s Minister of Gender, Children, Disability and Social Welfare recently announced that the government is going to develop strategies aimed at increasing access to ECD services in the country. This award marks the latest positive development for m2m’s growing ECD programming, which forms part of our family-centric approach to tackling HIV’s causes and effects in an integrated way. Since 2015, m2m has delivered high-impact, community-based ECD services designed to give children the opportunity to thrive, not just survive, and in 2016 we reached 14,093 HIV-exposed and vulnerable young children with integrated ECD services in Kenya, Lesotho, South Africa, and Swaziland. We look forward to beginning our ECD work in Malawi early in 2018 and are grateful to the Hilton Foundation for making this possible.